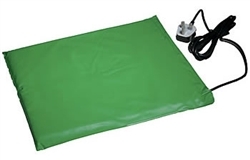 The soft vinyl pad size 43x38cm (17x15) uses 220/240 volts giving off 12 watts of energy and used as either a secondary or proprietary heating source. Easily positioned with the 183cm (6) power cable can be cleaned with a gentle wipe using a mild detergent. Ensure the plug is removed from the power source before commencing. The pad includes a Thermostat which regulates the heat to approximately 40C. Care must be taken with the amount of bedding used to maintain heat. We also recommend the power cable be covered using our Metal plastic coated cable cover (MF/PVC) for pets liable to chew.